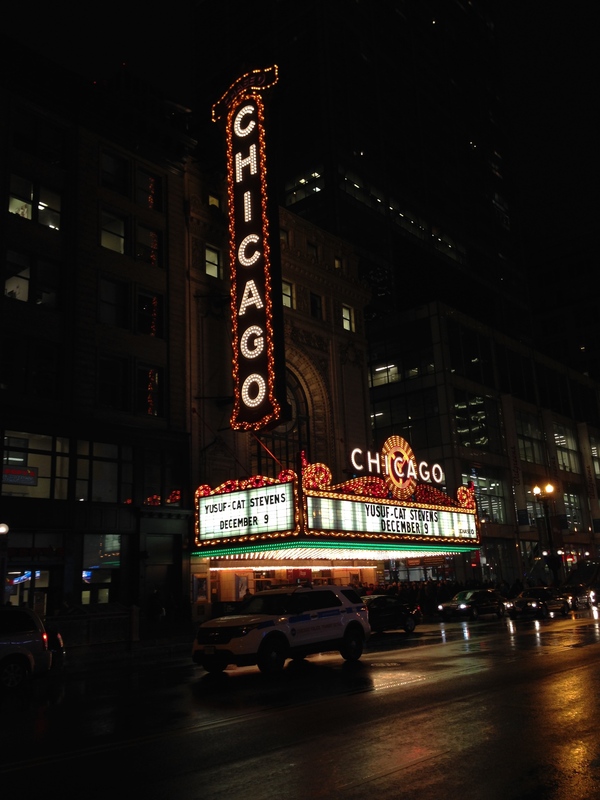 Last Tuesday, Naoto and I went to see Cat Stevens at the Chicago Theater. A) I thought his name was Yusef now and he gave up on touring in the US over thirty years ago. B) Who is Cat Stevens? C) Ohmygoodness! Did he play Peace Train?! Well, to answer your questions, this is his first US tour since 1976. This explains all you need to know about Cat Stevens. And, yes, he did play Peace Train. I cried. When I found out he was coming to Chicago (one of six cities on his tour of the US and Canada) I couldn’t wait to buy a ticket. I know it’s not the same as growing up with his music, as most of the audience did but Cat Stevens was a big part of the early days of my relationship with Naoto. We used to listen to his Greatest Hits albums all the time on lazy Sunday mornings. In the days leading up to the concert, I was getting really excited, then it occurred to me that maybe he would only play his new stuff and refuse to play all of the songs that Naoto and I loved. Thankfully, I was able to read about his earlier concerts in Boston and Philadelphia and I was reassured…all of the old, familiar songs with some new ones sprinkled in. Whew! The concert started a bit late because of the large amounts of security, but when Cat Stevens stepped on the stage, I knew it was going to be worth the wait. He came out to thundering cheers and a standing ovation and quietly started playing. His first song, “The Wind”, brought tears to my eyes. (Actually, I found myself tearing up for a large part of the concert while I sang along quietly with Naoto next to me.) Once the first song was over, people cheered “Where have you been?” and Cat Stevens seemed to take it all in stride. He was definitely a working man during the concert. He didn’t reminisce very much about his early days, only giving brief introductions to his songs, old and new. He reminded us that “The First Cut is the Deepest” was his song before it was covered by Rod Stewart and Sheryl Crow. And while women were screaming “I love you, Cat/Yusef!” he mostly ignored them and got back to the song at hand. During the concert, Cat Stevens alternated between playing the guitar and the piano and his band was incredible. He played all of the old hits that I could remember at the time, except “Hard-Headed Woman” which was requested via screams from the audience a few times. He said he cleaned up “Another Saturday Night” a bit, though we couldn’t remember the lyrics well enough to figure out where. (I think maybe the part about having two women?) Oh and he switched out the lyrics in “Here Comes My Baby” to say “You’re forever texting on the phone” which got a good laugh from the audience. And his new stuff was really solid…I wish we had listened to his latest albums before the concert, but we didn’t and we still enjoyed the unfamiliar songs. But as usual with someone who has a long career, the audience really connected with him most on his old stuff. I’m including the set list, borrowed from this Greg Kot review in the Chicago Tribune. 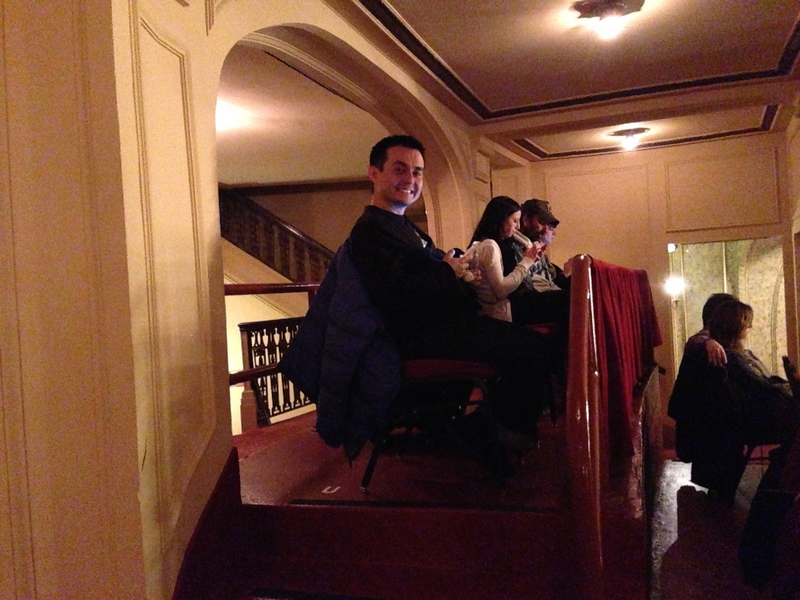 And about our seats…we were in the very last row of the very top balcony at the Chicago Theater (Row U!!) At first, we laughed and cried that they were the worst seats in the house. We were so far up, we were practically dripping off the ceiling and we didn’t even have theater seats! They were banquet chairs! But then we realized that we could stand up and dance around as we pleased because there wasn’t a row of chairs crammed behind us. And we never had to get up to let anyone pass through because the others in our row could walk behind our chairs. And we had all the leg room in the world. Not to mention we had a direct view of the stage and no one standing up in front of us could obscure it. So, while it would have been nice to be in the front row, we were pretty happy with the situation by the end. I feel so lucky that we got to see Cat Stevens…I want to make live music a priority in 2015–it makes my heart sing! P.S. Cat Stevens did a Tiny Desk Concert for NPR recently. I love the Tiny Desk and this one is so good! Wow, Cat Stevens, how great to have seen him perform in person. I loved the Tiny Desk Concert. Yes! 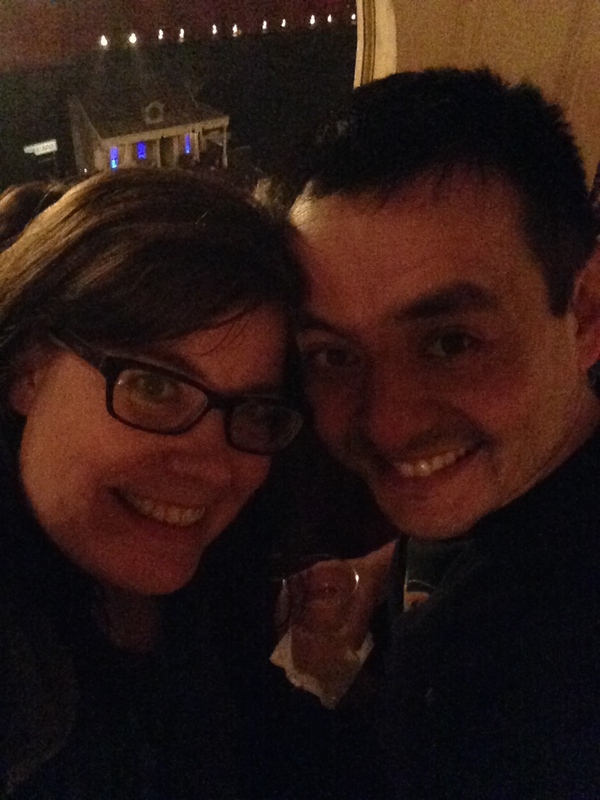 It was a great concert…I really hope he comes back to Chi-town again! My mom and I were at the concert that night too. Somehow I got seats close to the front of the balcony. Too bad we didn’t run into you guys! Cat Stevens is one of her favorites and I grew up listening to him. It was a great show! Happy Holidays! No way! Thats awesome! The seating thing must have been really random. We werr sitting next to people who ordered during some exclusive window of time (for buying the album) and they had the same bad seats as us. (We ordered on the first day of general sales.) Too bad we didn’t run into you! Ha! The Harold & Maude soundtrack is soooo good! !